Direct from Havana, 20 March 2015. Surely, Washington wants to impose its conditions. Washington conditions never serve an ally, let alone a foe. Washington conditions are always set to first serve the ‘national interest’- i.e. the interest of the US corporate and financial elite. Most vassals simply accept. Their happiness to be recognized in the Washington camp compensates for all the pitfalls Washington hegemony imposes. Just look at Europe with the TTIP (Transatlantic Trade and Investment Pact) which – currently being negotiated in secret! – if approved by the neoliberal European Commission, spells not only disaster for European generations to come, but means the EU being literally colonized by the US; slavehood for EU citizens. Cuba will not accept such conditions, for sure. Cuba has already set some of its own conditions, one of them being the return of Guantanamo, originally and under past Cuban puppet governments a 99-year concession that has expired years ago. Guantanamo today is pure theft. The criminal capture of a piece of another country’s territory, so that no US law could be applied to the crimes committed there. Torture of so-called ‘terrorists’ and terrorist suspects in the US-stolen enclave of Guantanamo are well and alive. No US law can stop the crime. International laws are ignored by empire. Washington, the exceptional nation, is above all laws. If a judge, national or international, doesn’t conform, he is simply removed or eliminated. Isolation has been gradually fading over the past years. Russia and China and many ‘amigos’ in Latin America and Europe – Venezuela, Brazil, Argentina, Mexico, Spain, France, to name just a few – have established almost regular trading relations with Cuba. Despite the constant threat of ‘sanctions’ by empire. It is high time for the White House to change tactics if it doesn’t want to lose out to its arch-enemies Russia and China. Many Cubans have a sense of disillusion, that they simply welcome any possibility of change. When asked, almost all say, ’it’s a good thing. We are looking forward to it’. However, they are discrete. Nobody openly complains and less so to curious foreigners. When prompted about how they think Washington will help them, they don’t know. They just want change. Not regime change, to be sure, a better life. They want hope. They want a chance for future generations. Cubans are not hungry. But they see an enormous disparity between themselves and the rest of the world. Especially when they see plane loads of tourists arriving, spending multiples of their monthly incomes for one night in four or five star hotels. They are not jealous per se, but they see the enormous difference between themselves and those who have access to foreign exchange, including some Cubans who receive money from their families in the US, Cubans able to travel abroad as artists or academics, or Cubans able to mount small businesses with the help of friends and families abroad. They see that something is not quite right. And this in a country where social and economic equality is one of the Government’s priorities. Cubans are not afraid of hard work. Cubans are creative; they have great ideas; they are highly educated; they know what is going on in the world, much better than the average European, or North American for that matter. Cubans are inventive. They have savvy for advancing their country and improving living conditions for themselves. Cuba has large agricultural areas, fertile land, but according to local academics, more than 50% of suitable agricultural acreage lies idle. Cuban farmers lack incentives. Government controlled prices do not cover costs, or leave insufficient margin for the hard work of farming. Cuba, with its 11 million inhabitants could be more than food self-sufficient. However, Cuba imports about 80% of food which it rations to its people. None of the Cubans want to lose the tremendous achievements of their Revolution – one of the world’s best systems of health and education, a country of peace and tranquility – a country where crime is almost non-existent. What they want is a standard of living that corresponds to their capacities – physical, academic and entrepreneurial. When prompted, they also realize that Washington doesn’t bring the solution. The solution has to be found from within. They see what Washington is doing to their brothers in Venezuela – sanctions, embargoes, outright economic warfare. – And for what? – To subjugate the people and to control their resources; colonization of the Bolivarian nation, the first step in taking back Obama’s ‘backyard’ – South America – the only part of the world, other than Russia and China, that has successfully detached itself from empire in the last couple of decades and so far resisted Washington’s attempts in meddling in South America’s sovereign affairs. They have created UNASUR and ALBA, solidifying their unity. Cubans say we are strong. We have 56 years of revolution on our backs and in our hearts; we know how to defend ourselves. We have fought a civil war for more than 5 years and kicked the Yankees out. We have successfully defended ourselves against the empire’s aggression by air and sea, led by President Kennedy in 1961. We will do it again, if we must. Indeed, Cubans are strong. They are tenacious. They have tremendous will power. But Cubans also must be reminded of today’s reality. Once Washington puts its heavy boots in a country, it’s (almost) impossible to get rid of them. If the boots are insufficient, the three-branched war machine will follow – bombs, ‘sanctions’ by economic fascism (neoliberalism) – and relentless propaganda. Everywhere they put their foot, they sow disaster, leave behind rubble and death, countless refugees, desolation for generations to come. Cubans know that. I talked to dozens of people in the street, in restaurants, shops, libraries – from workers, to taxi drivers, to medical doctors, to economists, to professors and other academics, to artists and even an Angola war veteran – their views are consistent: ‘We can’t continue like this’. These people are all brilliant in their own ways. And they are all desperate for a better life with a vision towards the future. – But to repeat, not regime change at all, especially not Washington style, but internal change for a better life and a brighter future. A cab driver told me, Cuba is wonderful, a bit tranquilo – even boring. But your country is flooded with tourists like never before, I countered. There is hardly an empty bed in Havana; you have more tourists than your infrastructure can reasonably absorb. Yes, he said. But almost all of them are ‘package tourists’. They come in prearranged, all inclusive tours. They are picked up in buses from the airport, brought to four or five star hotels, then driven around from one site seeing place to another; they eat in pre-arranged restaurants and then – hop, he flipped with his fingers – and off they are. None of them touches any local business; they don’t take taxis, they hardly talk to Cubans; they don’t see how we really live. The money the international tourists pay for their tours is shared between the foreign travel agent and the Cuban government. 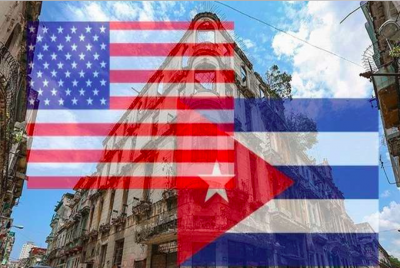 None of it trickles down to us, the common people, who earn the equivalent of between 25 and 40 dollars a month, while a room in a 5 star hotel costs up to US$ 300 a night, or 15 to 20 times the monthly wage of the average Cuban. He didn’t sound jealous at all; just matter-of-factly. Cuba’s economy is beset by multi-layered distortions – distortions as results of accumulated ‘corrections’ over the past 50 years that led to an economic and financial complexity, today unreformable by traditional means. After the collapse of the Soviet Union, when the pillars of the Cuban economy suddenly and for the Cubans apparently without warning imploded, corrections and counter-corrections multiplied Cuba’s economic conundrum. For the past twenty-five years, Cuba has known a two-tier economic system of sorts. The country uses two currencies, one for local use, the Cuban Peso (CUP) and the Cuban Convertible (CUC), mostly for foreigners and foreign trade. The CUC is closely linked to the US dollar, almost one-to-one. The conversion rate between the CUP and the CUC is 1 : 25. It takes 25 CUP for one CUC. The average Cuban monthly salary is between about 600 and 900 CUP, i.e. about 25 to 40 US dollars equivalent, the relation between the earnings is that of a worker versus a medical doctor. Of course, food, lodging, electricity, water and other services are state controlled and cheap; education, health and other social services are free. Nevertheless, this two-currency system creates an enormous gap between those with access to foreign exchange and those who simply live on their CUPs. The Cuban GDP is said to be close to the equivalent of US$ 70 billion, although it is difficult to understand the arithmetic behind this indicator, given the monetary distortion. Total services, including tourism account for almost 75% of GDP, Industry, including nickel exports, for 20%, while agriculture contributes a mere 5% to Cuba’s economic output. Similarly, GDP growth over the past 5 years has been unstable, fluctuating, between 1% and 4 %; today it stands at about 1.4%. Debt is about 37% of GDP, less than that of the average Latin American country. Foreign reserves are said to be US$ 10 billion, about 15% of GDP, a healthy reserve for a country with 11 million people. However, the reserve is left untouched, like money in a safe, with the expectation that it might attract foreign investors – and serve as a rescue and recovery fund for hurricane disasters. The currency distortion exacerbated by the lopsided GDP composition and the unused reserve funds, one would think requires first and foremost an internal, perhaps radical restructuring of the economy. It could start with delinking the CUC from the dollar and devaluing the CUC to a level which would allow eliminating the local CUP, converting Cuba into a single currency system, a step taken by China, when they transformed their double currency system into a one-currency economy in 1984. This might mean starting from square one, so to speak – local production for local markets. Loosening at the same time Government control on local initiatives would bring the necessary incentives to restart the productive engine. Argentina may serve as an example. When Argentina’s economy collapsed in 2001, the Government broke the peso-dollar parity, devalued the peso by some 60% and started afresh – local production for local consumption. With its own currency, Argentina gained back its economic sovereignty, thus, the ability to negotiate its foreign debt at its own terms. Over the next decade, Argentina grew on average by 8% – a highly distributive DGP growth, helping to reduce poverty from close to 70% in 2001 to way below 10% in 2014. The solutions for an internal problem never come from outside and less so from the United States. Foreign investments usually come with strings attached, some with steel chains. Following the US and European conditions for their investments, might imply accepting the dictate of the IMF, World Bank and IDB (Inter-American Development Bank) neoliberal economic disaster policies. What these policies of economic fascism have done and are still doing to the world – so-called ‘structural adjustments’ in Africa, Latin America, Asia – and lately the manufactured Eurozone crises starting in Greece, Spain, Portugal, Ireland and even Italy – speak for themselves. The latest example of empire’s destruction for dominance is Ukraine; first by a CIA / State Department / NATO inspired coup in February 2014, then by a civil war instigated by the newly US / EU-imposed Nazi-Government of criminal thugs in Kiev – civil war against the eastern Ukraine brothers, led by CIA mercenaries with NATO ‘advisors’ – and finally by an illegal financial war, theft of resources driven by debt, imposed by the infamous ‘troika’ – IMF, European Central Bank (ECB) and EC (European Commission). Cuba’s sizable reserves might serve to initiate economic recovery in priority sectors like agriculture, telecommunication, tourism and rehabilitation of local infrastructure. The conditions and priorities for foreign investments should always be laid down by the host country. Foreign investors should be linked up with local enterprises as joint ventures, like China did, when it opened its borders to foreign investments in the 1980s. A foreign partner must never be allowed a majority holding. In the case of Cuba, priorities for foreign investors might include, among other sectors, cutting edge technologies in communication and computer sciences. According to a Cuban economist, an academician, the multi-faceted complexity of economic distortions, combined with the need for investments and increased output efficiency, leads to fear of making the wrong decisions which leads to inertia which leads to a stagnant economy that lacks incentives for people’s initiatives. This vicious circle of inaction must be broken, but certainly not by an outside ‘change agent’, but from within.